President Obama, using executive power, indefinitely banned offshore oil and gas drilling in wide areas of the Atlantic and Arctic waters just one day after he advised President-elect Donald Trump to not use executive orders while in office. The White House announced on Tuesday that Obama would use a little-known provision in the Outer Continental Shelf Lands Act of 1953 to ban offshore drilling on large swaths of the ocean floor from Maine to Virginia and along much of Alaska's coast. The action is not an executive order but rather Obama invoking an obscure provision of existing federal law that is rarely used, which says the president "may, from time to time, withdraw" federal waters that are not already leased from oil and gas development. Some see the drilling ban, which will include hundreds of millions of acres, as an effort to make it more difficult for Trump to rollback many of the environmental regulations that the Obama administration has implemented. The White House announcement came one day after Obama implored Trump, in an NPR interview aired Monday, to not resort to using executive orders to implement legislation if possible. 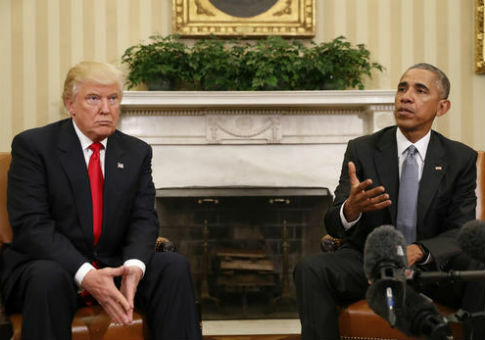 "My suggestion to the president-elect is, you know, going through the legislative process is always better, in part because it's harder to undo," Obama said. Obama has issued over 260 executive orders during his eight years in office, according to the American Presidency Project, including orders on immigration, health care, and climate issues. He has not issued as many executive orders as former Presidents Bill Clinton and George W. Bush, but critics charge that some of Obama's orders have been more extensive, altering legislation that is already on the books. In the NPR interview, Obama said that he only resorted to signing executive orders after his own party lost power in Congress. "In my first two years I wasn't relying on executive powers because I had big majorities in the Congress and we were able to get bills done, get bills passed," Obama said. One of President Obama's signature executive orders on immigration was blocked earlier this year by the Supreme Court due to a split decision by the eight-person court. The order would have allowed millions of illegal immigrants to be shielded from deportations and apply for work authorization programs. Trump has not ruled out using executive orders to pass legislation when he takes office. "I won't refuse it. I'm going to do a lot of things," Trump said in a January appearance on NBC's "Meet the Press." "But I'm going to use them much better and they're going to serve a much better purpose than he's done," Trump added, referring to Obama. This entry was posted in Issues and tagged Donald Trump, Drilling, Obama Administration, President Obama. Bookmark the permalink.